Exception occured while running the Sync Process. Erro Details: Login failed for the user the user ‘User Account’. SQL authentication is set to Windows Authentication mode only. Set mixed mode authentication in SQL by following below steps and restart the CrowCanyon Data Sync service. Open SQL Server Management Studio Express. Choose Windows Authentication from the Authentication drop down list. Click Connect to open the Microsoft SQL Server Management Studio Express window. Right-click the SQL instance and choose Properties to open the Server Properties – window. Click Security on the left hand side. Choose both SQL Server and Windows Authentication Mode on the right side. Click OK to close the Server Properties – window. Right-click the SQL instance and choose Restart. Click Yes to restart the SQL server. Validation: To check the authentication, logon to the SQL studio with SQL Authentication mode and it should allow logging in without any errors. Crow Canyon Data Sync service runs but no items from the database will be synced in SharePoint. This generally happens when some of the files like .exe, .dll are downloaded from the browser and are not trusted. In this case, we do not see any error but the items sync will not start at all. Crow Canyon Data Sync service has dependency assembly files “Microsoft.SharePoint.Client.dll, Microsoft.SharePoint.Client.Runtime.dll” and they should present in the service installation folder and they are missed. Stop Crow Canyon Data Sync service, place the missing dependency files in the installation folder, start the Crow Canyon Data Sync service. Also, unblock all the package files in the installation folder by following below steps. 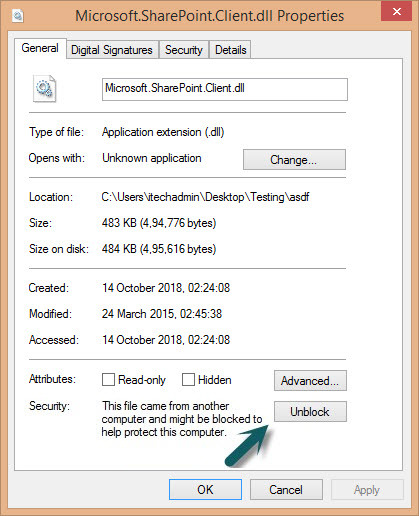 Right Click on the “Microsoft.SharePoint.Client.dll “ file, click properties, if “Unblock” button is visible under “General” tab at the bottom in the security column, click unblock. See sample screenshot below. Repeat the above steps for all the files in the installation folder (Configuration.xml, CrowCanyon.DBSyncService.exe, InstallUtil.exe, Microsoft.SharePoint.Client.dll and Microsoft.SharePoint.Client.Runtime.dll). How to address “Chrome detected unusual code on this page and blocker it to protect your personal information” error in Google Chrome browser when modifying web part pages?